Purpose: This modification will fix the rear hatch release problem on 1999 and newer F-Body's. The previous rear hatch release fix install document would only fix some F-Body hatch opening problems. 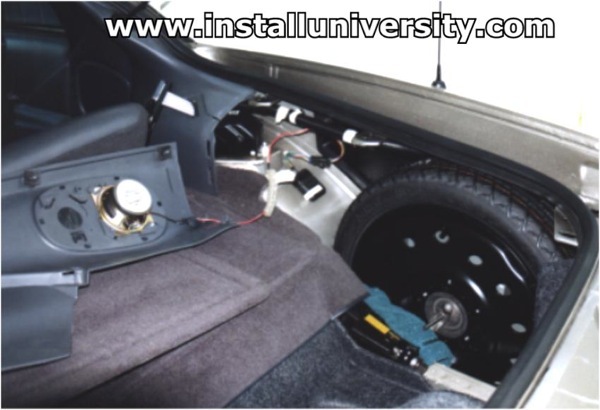 This install procedure has fixed all F-Body's that we know of to date. Press the rear hatch release button on your key fob or in the car and the door doesn't quite release and you have to keep hitting the button waiting on the door to release?? Yeah, we figured you knew what we meant. This is a problem that has plagued many of us F-Body owners to death. We have a fix that is so simple you won't believe what you are about to read! 1. 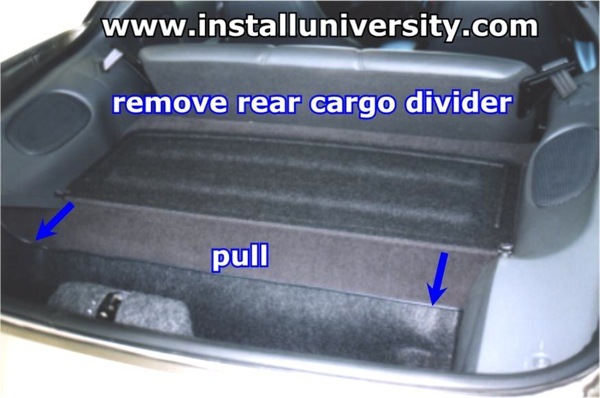 Open the rear hatch of your F-Body and remove the cargo divider by pulling it toward the back of the car as shown in Figure 1. 2. 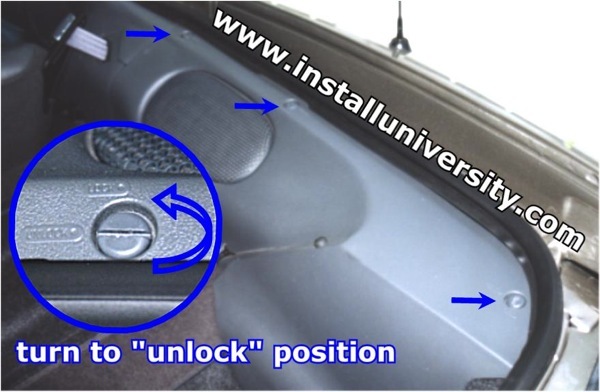 Move the locking screws to the "unlock" position on the inside passenger quarter panel. 3. Pull the inside passenger quarter panel away from the car and lay it on the top of the cargo compartment as shown in Figure 3. Be careful not to yank it away to far because you will tear the speaker wire all up. 4. 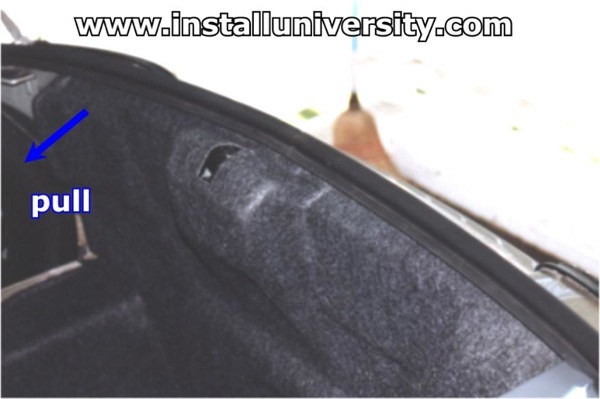 Pull back the cheezy cargo interior on the inside back of the car as show in Figure 4. 5. 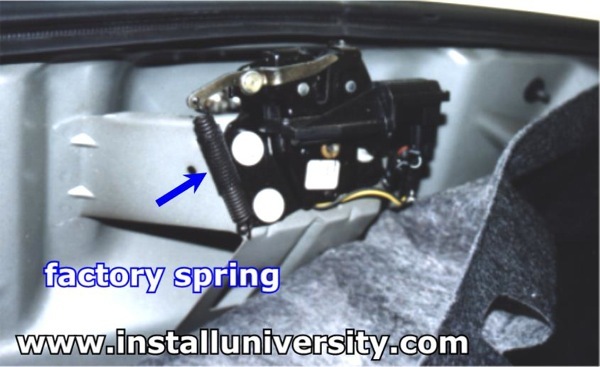 Locate the factory spring on the rear hatch release mechanism shown in Figure 5. 6. 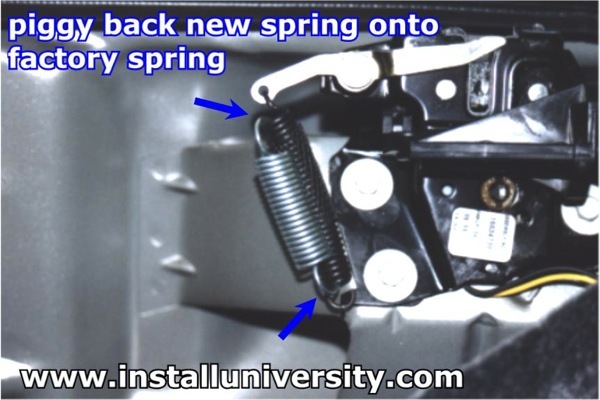 Place your new spring from Home Depot, Lowe's or local hardware store onto the factory spring as show in Figure 6. We used a 5/8" diameter 2.5" long spring to piggy back on the factory spring. We had to use a pair of needle nose pliers to bend the ends of the spring we purchased so it would hook onto the factory spring. No big deal just use common sense here. Our spring cost use about $3 at Lowe's and came in a pack of two. So give one to your best F-Body bud. 7. Try out your rear hatch release now! Watch how it works and do not be shocked when your hatch tries to launch itself into the air! Comments: Now, try the hatch release. Does your hatch want to fly up to outer space when commanded to open? Great!! You should experience any kind of a problem unless the locking mechanism malfunctions. Our hatch pops right up every time we have opened it. Even in 20 degree weather so we know we have now fixed the rear hatch release problem. At first we thought the cold weather was responsible for our malfunctioning hatch. Well, it turns out that it was not. Have fun!